Location: Cuyamaca Mountains, eastern San Diego County. From I-8, 40 miles east of San Diego, take Highway 79 north for 12 miles to the Paso Pacacho Campground on the left side of the road, past the fire station. (Note the sharp left turn after 2 miles on Highway 79; follow the signs for Cuyamaca Rancho State Park). From Julian, take Highway 79 south for 11 miles and turn right into the parking area. Day parking is $8 per vehicle. 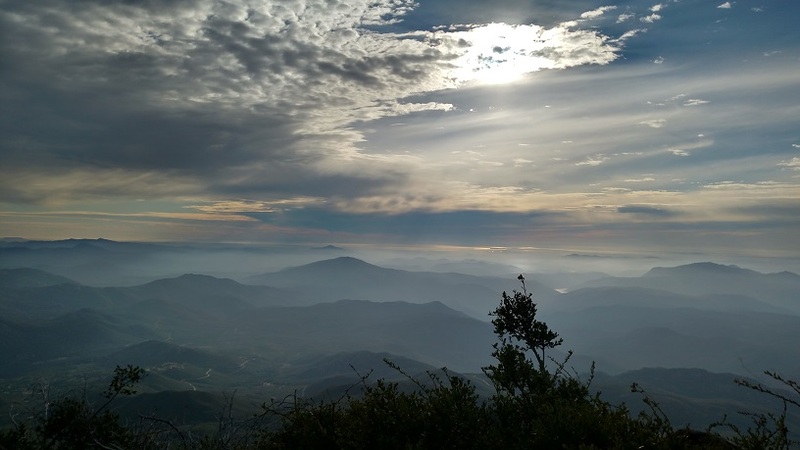 Can an entirely paved hike to an antenna-heavy summit rank among San Diego County’s best? When the peak in question is Cuyamaca, the county’s second highest at 6,512 feet (missing Hot Springs Mountain’s mark by a mere 7 yards), the answer is yes. 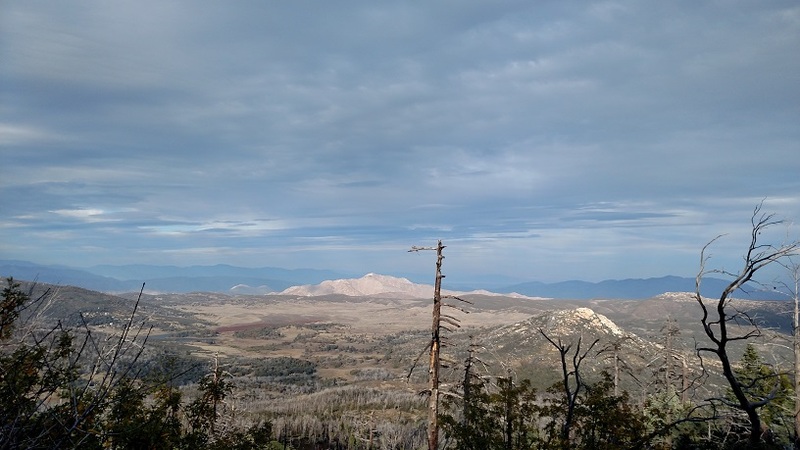 The scenery on this vigorous hike is so good that you’ll likely forget you’re hiking on pavement and the antennas on the summit do little to detract from the terrific views. Residents of Orange, Riverside and even L.A. Counties will find Cuyamaca Peak to be a worthy destination. The hike on the Lookout Fire Road to the peak is also the only major dog-friendly hike in Cuyamaca Rancho State Park. 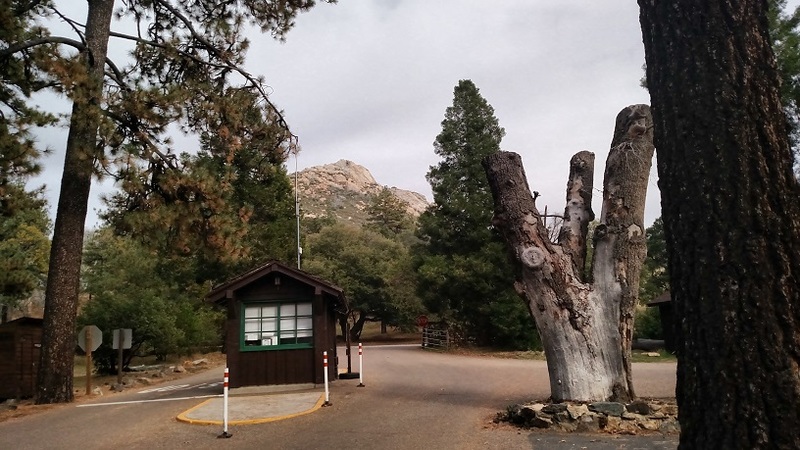 From the Paso Pacheco Campground, head through the entrance gate, turn right on Highway 79 and briefly follow it to the start of the Lookout Fire Road. Pass a few residential buildings and begin hiking on the narrow paved path. The trail starts ascending gradually before beginning a rigorous climb to a junction (1.3 miles from the start) with the Azalea Glen and Fern Flats Fire Roads. A bench carved into a log makes a nice resting spot where you can enjoy view of Stonewall Peak to the east. 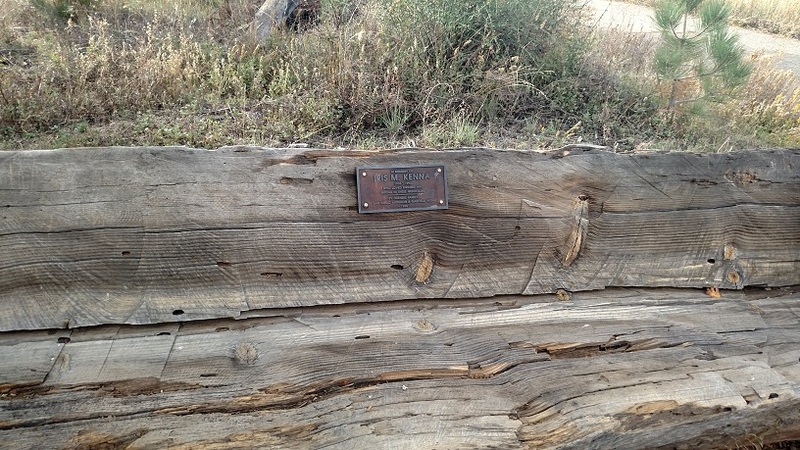 The bench is dedicated in memory of Iris Kenna, killed by a mountain lion in 1994. After leaving the junction, the stiff climb continues. 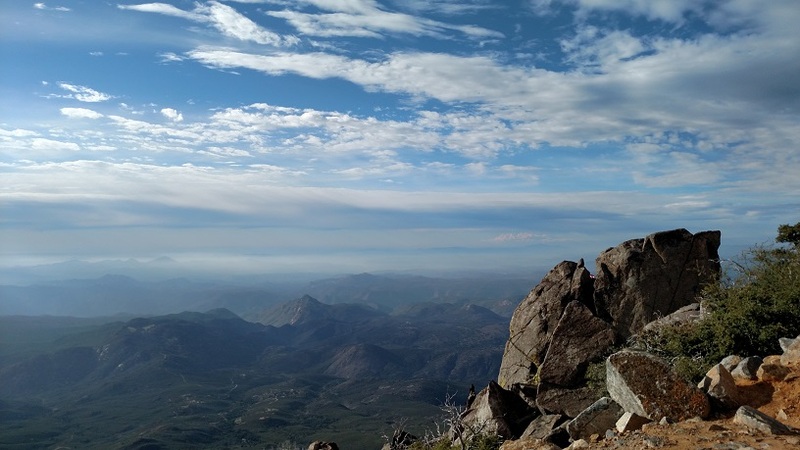 Your efforts are rewarded with increasingly panoramic views, including Middle and North Cuyamaca Peaks, Granite Peak and Stonewall Peak, which you are now above. 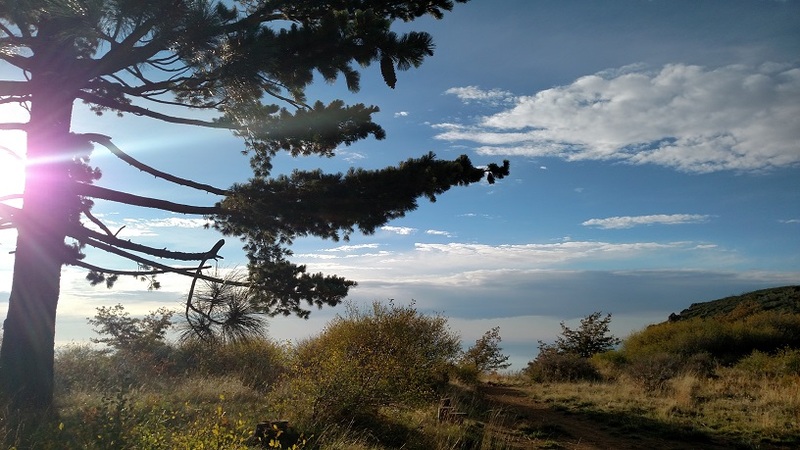 At two miles, you briefly enter a pine woodland, emerging at a bench with terrific views to the west; a preview of the summit. 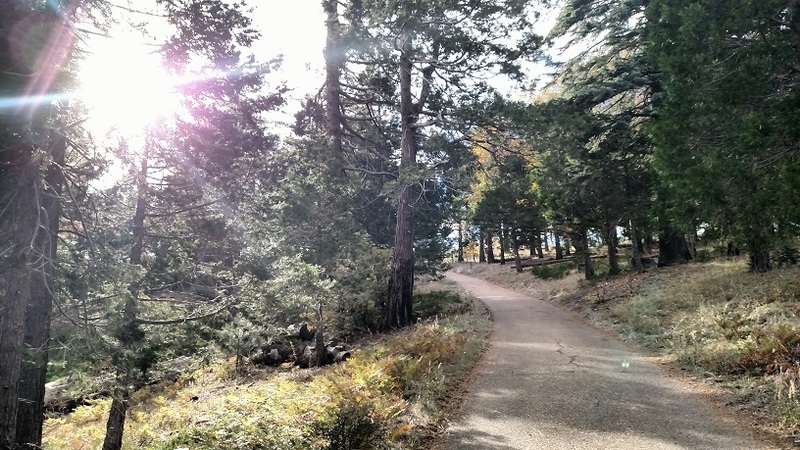 The road dips back into a a cover of pines and black oaks, passing by a final junction with the Burnt Pine Fire Road before beginning a last, steep push to the top. At the peak, antennas and buildings prevent a true 360-degree panorama, but the views are nevertheless exceptional. On days of good visibility, count on seeing the Coronado Islands, the Santa Ana Mountains, the Palomars, the Santa Rosas and more. A short scramble from the road brings you to the true summit where you can sit on some flat rocks and enjoy the panorama. After taking it all in, retrace your steps down the fire road, or if you have no dogs and want to try a different route, you can descend via the Conejo and Azalea Glen Trails. I hiked Cuyamaca Mountains many times when I was a kid. I haven’t been in years. Thanks for the reminder! You’re welcome! Glad you were able to reconnect with them. Such a gorgeous place.